If you’re like me you’re constantly on the lookout for ways to improve your photography and in this day and age there are a lot of sources for knowledge. Blogs, social sites, books, magazines… you don’t have to look far to find someone willing to offer you advice. 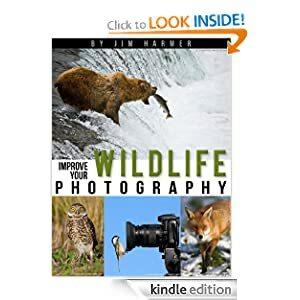 I recently purchased and read Jim Harmer’s “Improve Your Wildlife Photography” kindle edition book. Like most photography books you will find that there is some rehashing of things you already know, but there were some nice tips included for my $3.99 investment. It’s not a long book (only 40ish pages), but that’s the beauty of e-publishing. It doesn’t have to be crammed full of 200 pages of fluff to make the buyer feel like it was worth their money. Have you read any good photography books or stumbled upon any worth while blogs lately? Drop a comment below and share your most valuable resources. Nice blog here! I appreciate it. Wildlife rescue magazine is an online magazine devoted to the care and emergency training of our beautiful Australian wildlife. Thank you for the nice comment, Jeselle Arce and for the wildlife reference. I'll be sure to check it out.